Best Buy taking BlackBerry Tour pre-orders | BlackBerry Blast! The BlackBerry Tour is due out in a few days but if you can't wait, you can pre-order your Tour at Best Buy. 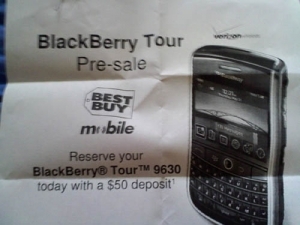 All you need to do is drop down a $50 deposit and Best Buy will make sure you get a BB Tour come Sunday. There hasn't been a lot of press on this offer, but it is there. Visit your local Best Buy store and ask for the details.